Coles Bay (pop ~100) is an exceedingly popular gateway to the Freycinet National Park for those interested in a more ``off the beaten track'' form of travel. The bay (right) has fine beaches for swimming, good bushwalking and birdwatching. There is a wide variety of local flora (over 60 varieties of orchid), and the permanent inhabitants (possums and wallabies) are bold enough to take close-up looks at their human visitors. Northwest of Coles Bay is Moulting Lagoon, breeding ground of the black swan, and along the northern coast are the grand dunes of Friendly Beaches. Areas near Coles Bay are well suited to scuba diving, water skiing, swimming, fishing and rock climbing. Boats such as the Kahala are available for charter, offering patrons the opportunity to see whales, dolphins, seals and sea eagles in their natural habitat. Coles Bay is frequently used as a staging point for those wishing to visit the Freycinet National Park. Three pink granite mountains (the Amos, Dove and Mayson) form the Hazard Range, a signature of the 11,930 ha. park. 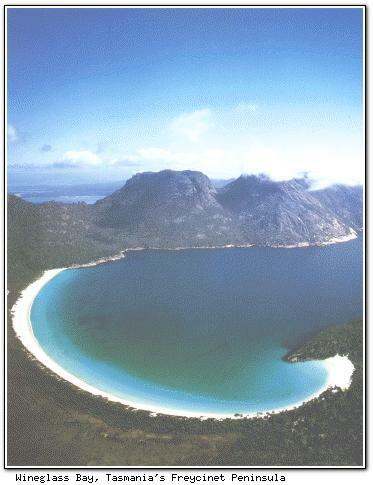 But the best known attraction is Wineglass Bay (below). Its perfect formation and white sand make it one of the most photographed natural features in the state. There are many walks in the National Park, ranging from short family walks to overnight expeditions for experienced bushwalkers, which reach the southern tip of the peninsula. The walk to Wineglass Bay is considered to be of moderate difficulty. Coles Bay has three 4-star holiday units and four 3½-star facilities (RACT rated). There is an extensive backpackers lodge, and campsites are available within the National Park. Coles Bay is approximately a one hour drive south of Bicheno.